We Are Wysong! Our Future is Bright! Normal arrival time for students not participating in breakfast or the YMCA before school care program is 8:45-9:00. Students should arrive in time to be in their classrooms by 9:00. Supervision begins for students at 8:45 and is also provided for breakfast. Wysong School partners with the YMCA to provide before and after school care for families who are interested in this service. Please visit http://www.ymcalincoln.org/ for registration information. Please contact Meagan Nelson at 531-289-7864. Our current enrollment for 18-19 is near 500. Wysong is built with four classrooms at each grade level. What are the current number of classrooms at each grade level? We currently have five classes of Kindergarten, five classes of first grade, four classes of second, three classes at third, and four classes of fourth, and two at fifth. Our students, staff, and families helped select Wysong’s Mascot and school colors. 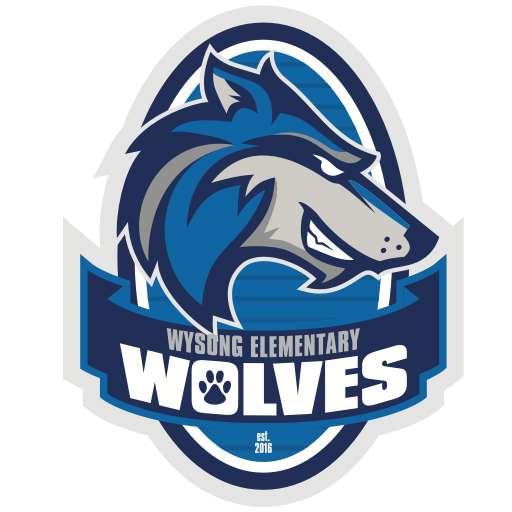 We are proud to be the Wysong Wolves. Our colors are blue and silver. We are fortunate to have a strong Parent Teacher Organization at Wysong. The PTO is helping us create and build traditions at Wysong. Their mission is to support and enhance their childrens’ education by being involved and supporting our school. I believe a strong Parent Teacher Organization is key to helping us provide additional opportunities and enrichment for our students’ school experiences and also an opportunity for families to become involved and learn more about our school. Working toward common goals and building community and culture within our school is important. I believe a student council group can be very instrumental in helping with ideas and also in leading our students. We are pleased to have our student council in place and helping lead many special events for our students and school. Students in 4th and 5th grade will have opportunities to participate in additional music groups. In 4th and 5th grade, students can participate in Orchestra. Orchestra students would have a small group lesson one day each week and then likely either a before or after school group rehearsal each week as well. 4th and 5th grade students could also choose to participate in Chorus which would meet one day per week either before or after school. Students in 5th grade may choose to begin to learn a band instrument. These students would also have a lesson one day per week during school and likely would meet for a group rehearsal before or after school. Typically students in 5th grade cannot participate in both Band and Orchestra but could choose one of these and also Chorus. Fourth graders could do both Orchestra and Chorus if they wish. Typically, the band and orchestra teachers at your current schools will talk with 3rd and 4th grade students about these opportunities. We will send out more information when we have our schedules determined. Lincoln Public Schools provides services for students with identified Special Education needs and also for students who are gifted. These services will of course be provided at Wysong as well. We also will have “Reading Recovery”, which is a research based reading intervention for students who need very targeted reading skill development in first grade. We will work closely with the schools from where our students are coming from so we have precise information about our students in regard to their academic and social strengths and needs. Visit the “Our Staff” tab on the Wysong website to see our staff members.